At a recent Honda test-ride day, I finally had the chance to throw a leg over what must be one of the oddest motorcycles on the market - the bizarre DN-01 "sports cruiser." The Dino's way-out looks don't particularly float my boat, but it's bristling with fascinating new technology, like Honda's 'Human-Friendly' automatic transmission (HFT), which operates as a CVT in Drive or Sports modes, but is also able to mimic a 6-speed manual box when you want to get some gumboot up it. Then there's the Combined Braking System (CBS) with ABS, which isn't quite as techno as the computer controlled Combined ABS system going into Honda's new sportsbikes, but it's still right at the pointy end of motorcycle brake technology. So how did it ride? The first thing you notice when you swing a leg over the DN-01 is that you're very definitely the center of attention. What started out as an eyebrow-raising concept bike has come through to production with its bizarre looks virtually unchanged. For better or worse, there's nothing on the road that looks remotely similar. The next thing you realize is that for all the "sports cruiser" branding, the Dino feels squarely like a maxi-scooter. That's not necessarily a bad thing - indeed, maxis like the Silverwing and the Yamaha T-Max are some of the most practical bikes on the road, and they can be a real giggle around town, too. Still, any pretensions to practicality are turfed out the window when you realise that the Dino's low-slung body shape doesn't actually provide any storage. Among all those acres of plastic at the front end, there's not a single hidey-hole for wets, wallets or phones. This is one of the few areas in which it seems directly related to sportsbikes and cruisers. Still, we're here to sample the Dino's marquee features - the HFT auto and the CBS with ABS, and to do that, we need to endure bemused stares from all and sundry as our helpful Honda representative shows us how to use the transmission. It's not too difficult to grasp - you start the bike in neutral or D (Drive) mode, and a switch on the left block lets you swap between that and S (Sports) mode. Both these modes are CVT, the only difference being that S mode holds the revs a little higher for quicker acceleration. Once the bike's running, you can then hit a trigger on the right hand side to engage M (Manual) mode, and here's where things get interesting. The D/S mode switch on the left switchblock then becomes a manual shift control, and you can run the Dino up and down six pre-defined, fixed ratios in the CVT. Flicking the trigger on the right again drops you back into either S or D mode, depending on where you entered Manual mode from. Oh, you can also go back and select Neutral, if for some reason you want to sit still and rev it. Go figure. Trundling down the road, enjoying the pleasant surge of torque from the Dino's 680cc V-twin - yes, the engine from the Transalp and Deauville - the HFT makes itself virtually unnoticeable in D or S modes. It's a very effective, clutchless twist and go. Jumping into Manual mode and surfing up and down the gears... Well, it works excellently and effortlessly. The gear changes are quick without being super quick, they're fairly smooth, and it's all exceptionally easy to control. In fact, for such an advanced transmission, it's almost... Dare I say it? Boring? It works beautifully, it's Honda smooth and it does everything that it says on the tin - but it's hardly the revolutionary riding experience that I was preparing myself for. On top of that, the Drive and Sports modes do such a good job of keeping the ratios where you need them that the Manual shift seems almost a little redundant. I mean, it's clearly there to give you a sense of connection to the engine when you're riding the twisties, and yet the bike's so unassuming and easy to ride that it doesn't put you in the mood to thrash it anyway. CBS with ABS - not to be confused with Honda's more advanced Combined ABS - is effectively two separate systems. 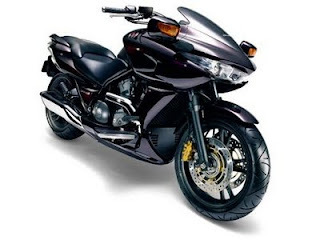 The CBS works largely as it does on Honda's Blackbird and VFR800 - it's a simple mechanical system that proportions the braking between both the front and rear brakes even if you only use one lever. If you ever find yourself on a bike with combined brakes, for God's sake don't do what my buddy Cam did when he got his CBR1100XX Blackbird - hold the front brake on and try to pull a burnout. Here's why - the front brake lever hydraulically actuates four of the six pistons in the front calipers, as well as one of the three pistons in the rear caliper. The idea is that when you grab the front brake, the bike doesn't pitch forward so much as it can with an unlinked system. Likewise, the rear brake pedal operates the remaining two pistons on the rear brake as well as one piston in each of the front calipers, so that you can get some decent stopping power out of the rear brake pedal. In Cam's case, the front brake lever stopped the back wheel from spinning up, and he burnt the clutch clean out of a brand new bike. Cam, you are a goon. The DN-01's ABS system works both front and rear. And how does it all feel on the road? Well, fine. The CBS is completely unobtrusive on a bike like the Dino - as long and low as it is, you're not likely to be pulling stoppies on it anyway. I tested the anti-lock mechanism both front and rear, on slippery wet tarmac and loose gravel, and was surprised how cleanly and quickly it pulled the bike up - jamming on the front brakes gave a few twitches through the steering, but nothing to rattle a rider's confidence. You can strangle the Dino's brake levers with merry abandon. And I think I would, daily, if I owned one. There's nothing like ABS to remind you exactly how much traction you've got, even in the wet. It's a great safety system on a bike, to be able to push to the very brink of traction in an emergency in the confidence that you'll stay upright while stopping as fast as possible. I've been critical of ABS on bikes before, but this system seems very practical on the DN-01. I'll have to try out that Combined ABS sometime to see how it meshes with a sportsbike riding experience, but sampling the brakes on the Dino has certainly made me more positive. The only real complaint I could muster about the brakes was that the rear brake pedal - a chunky thing you'd expect to see on a cruiser - was a bit high up; you have to lift your foot off the floor to get a boot on it. And with the rear brakes being such a comfortable and quick stop, I can see a lot of riders using this as their primary brake. A small issue that can be sorted out if you just cover the front brake. With the transmission and brakes out of the way - and they DO stay out of the way - the Dino is left to prove itself as a rider's bike. And it does a fairly good job of it. The steering is light and easy due to the bike's low center of mass. It flicks left to right smoothly and securely. The suspension is certainly set more for comfort than for hard cornering thrills, and this reveals itself in the usual slight wallow in bumpy corners. Ground clearance is a little better than I expected, but if you push on, the footboards will kiss the bitumen fairly quickly. Comfort-wise, the seat is plush but the forward footboards give you a sit-up-and-beg riding position. You're not lounging back like you would on a cruiser, you're certainly not tucked in like a sporty, and you don't feel as 'commanding' over the road as you might on a naked standard. It's pretty scooterish, even if it's not a step-through. I can't see it being particularly suited to long distances, but then it wouldn't be a backbreaker either. The fuel-injected motor delivers a friendly 61 horsepower, more than enough to clear off from the tin-tops at the lights, and an adequate figure for medium-pace cruising and scratching. The Dino is reasonably wide, but not too wide for lane-splitting if that's your cup of tea. As a package, it feels hugely refined. It's smooth, it reeks of Honda quality, it's easy to ride and doesn't feel like a bike to get in trouble on. Despite its heaped-on lashings of technology it's a doddle to get used to. Such a doddle that it failed to inspire me to look much deeper to discover where its charms might lie. I should add, my buddy Kenny test rode it straight after I did. Kenny's a Bandit man; as far as he's concerned, bikes have never gotten any better than the old 1200cc air-cooled Suzi. Kenny stepped off the Dino with a huge grin on his face. He loved it, the ride, the handling, the brakes, the transmission, it gave him a huge giggle and he liked it even more than the CB1000R. So it's clearly a personal thing. But here's the kicker - even if you're a big fan of this sporty/cruisy scooter, its refined ride and its bizarre looks, a lot of folks will be put off from buying it due to the exorbitant price tag - US$15,000 at retail. Yeah, well into exotic sportsbike territory, or you could buy yourself a perfectly good Fireblade and a maxi-scooter. Honda claims that sales have been better than expected - fair enough, although i haven't seen one in the wild yet. I'm not sure what the Dino's demographic will be. It certainly doesn't fit any of the standard market segments, and the rampant use of technology is simply too well-integrated to stir my gadget-freak side. Where it does stand out is where we started - looks. I would anticipate that for some years to come, the DN-01 is going to turn heads at just about any event. And that's a pretty neat achievement for a Honda!